Arrival Leh Kushok Bakula Airport (3500 m / 11565 ft above sea level). Upon arrival welcome and meet by our representative and transfer to Hotel/Guest for check in wherein welcome tea and coffee will be served. Complete half day rest at hotel for acclimatization as it is important at the height of Ladakh. Lunch will be served at 2:00 PM. Afternoon around 3:30 PM sightseeing to Shanti stupa and 17th century Leh palace. Dinner & overnight at Leh in Hotel/Guest house. Full day sightseeing of Indus valley. (47 Km one way - Round 94 km – 5/6 hrs). Today after breakfast around 8:30 AM leave to full day sightseeing of Indus valley, 16th century Shey palace, 14th Thiksay monastery and 17th century Hemis monastery. Sightseeing start with 17th century Hemis monastery 47km from Leh. On the way stop to take the photos of picturesque view of 16th century Shey palace and 14th century Thiksay monastery. You arrive at Hemis monastery around 10:30 AM. Hemis is the biggest monastery of Drukpa Kagyud Sect. After visiting Hemis monastery drive to Thiksay monastery on the same way back. Lunch at Thiksay in restaurant. Post visit Thiksay monastery and Shey palace. After Shey palace drive back to Leh you will reach Leh around 5:30 or 6:00 PM. Overnight at Leh in Hotel. Leh–Nubra Valley via (Khardong La pass 125 Km – 5/6 hrs drive). Today after breakfast drive to Nubra Valley, popularly known as the valley of oasis among the tourist. The road journey from Leh to Nubra Valley is passing through Khardong-La pass (one of the highest motorable road in the world at 5,602 Mtrs / 18,390 Ft) around 39 km from Leh. At the pass panoramic glaciers of Zanskar range. After 1:00 hrs drive from Khardungla pass there is Kardung village, the first village on the way to Nubra valley. Stop at Kardung village for lunch. You will reach at Deskit village around 3:00 PM or 4:00 PM, Deskit is main town of Nubra valley. Visit 14th century 14th century Deskit monastery and 107feet Maitreya Buddha at Deskit. After that drive to Hunder Sand dune 6 km from Deskit. Explore the scenic beauty of Hunder sand-dune and double hump camel riding. Overnight at Nubra valley in Hotel. Nubra valley – Leh by same route (125 Km – 5/6 hrs drive). Today after breakfast around 9:00 AM return back to Leh by same route. Stop at Kardung village for short hike in the middle of barley field and take the photos of charming of Kardung village. After short hike lunch at restaurant of Kardung village. Post lunch drive to Leh. You will reach at Leh around 3:00 PM or 4:00 PM. Evening free to explore the Leh market. Overnight at Leh in Hotel / Guest house. Leh – Pangong Lake 14,500 feet via Changla pass (140 Km – 4/5 hrs drive). After Breakfast leave for Pangong Lake passing through Changla Pass 17,350 ft. (the third highest motorable road in the world.). This route takes the visitor past picturesque villages of Shey and Thikse, and turns off the Indus valley by the side-valley of Chemrey and Sakti. 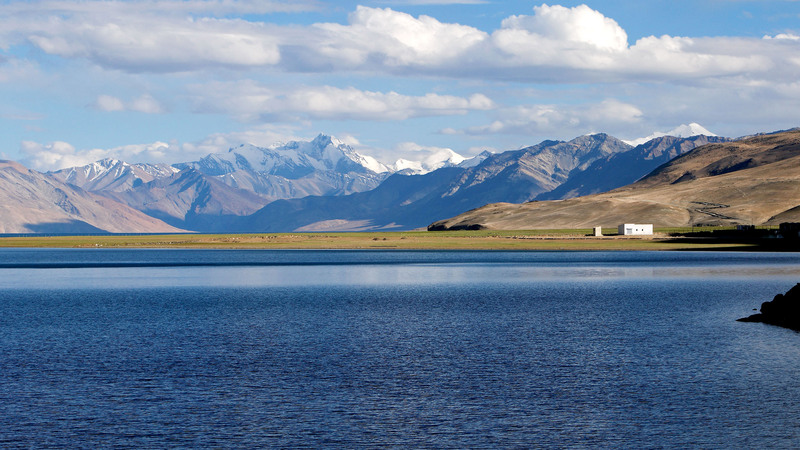 Pangong Lake situated at 14,500 feet (4,267 m). One rarely feels so close to nature and environment and the scenery is unforgettable. Hike at lake and explore the beauty of Lake. Overnight at Pangong Lake in deluxe camp. Pangong Lake to Leh by same route. (140 Km – 4/5 hrs). Today don’t miss to wake up early morning around 5:30 AM if you like to take the photos of sun rising view of Pangong lake. Breakfast will be serving around 7:30 A M after breakfast return back to Leh by same route on the way visit Chemday monastery. Lunch at Thiksay village in restaurant. After Lunch drive back to Leh and you will reach at Leh around 4:00 PM or 5:00 PM. Overnight at Leh in Hotel. Leh – Delhi. After early morning breakfast transfer to airport and fly back to Delhi with Sweet Memories of Ladakh. Tour and service end. Hotel GST Taxes,Service Charges,Driver Expanses.Toll Taxes,Parking Charges.